What is return to invoice in car insurance? We all have a few friends for whom their car is their baby! They’ll painstakingly care for it, look after it and protect it. But one can never quite predict what fate has in store. There is always the risk of your car getting stolen or totally damaged. And while you would still be recovering from that terrible shock, you get another one when you get your insurance money, which would be the depreciated amount, based on your Insured Declared Value or IDV. If this sounds like a nightmare, you need to know about Return To Invoice (RTI). In a normal insurance cover, the maximum amount of claim you can make is restricted to its IDV. RTI is an add-on option which covers the gap between the Insured Declared Value and the invoice value of the car. For context, the IDV is lesser than the invoice value of your car because of depreciation that happens over years. Sounds Greek and Latin? Basically, the coolest thing about the RTI option is that it fetches you the on-road price means, the price you paid for your car and doesn’t account for any depreciation! Return To Invoice is NOT an option you can claim to compensate for small blemishes and repair bills, like the last dent in your car or the crack on your windshield! Partial loss can be handled through Own Damage Cover and other addons like ‘Zero Depreciation’, whereas RTI helps you recover financial losses that arise because of a stolen car or a car damaged beyond repair i.e., when you have suffered total loss. When you bought your car, you would have paid the ‘On-Road’ Price. That would have included the Ex-Showroom Price. Plus the Road Tax. And then to top it off, the Registration Charges depending on the class / make of the car. Phew! After all those payments, when your car is totalled, you get back a lesser amount than what you initially paid based on your IDV! We agree, it’s pretty unfair. This is why on the RTI cover, your IDV is the same as the ‘On-Road’ price (a.k.a. the total of all those three things you paid). In other words, when your car is stolen or damaged beyond repair, you get the original price you paid as compensation. And where does Digit come into this? We know RTI already sounds pretty cool and you can’t wait to know what Digit offers you as part of our Return To Invoice cover. If the exact same make, model, variant is discontinued, we shall compensate with the last available invoice price of the Insured Vehicle immediately before discontinuation. Not only do we pay the First-time Registration Charges of the New Vehicle, we also pay the Road Tax. We believe it’s better to be safe than sorry and even provide you with an Insurance Policy to cover the New Vehicle, which includes Own Damage Cover, Third Party Liability Cover and other Add-on covers. While the Zero Depreciation Add-on cover also sounds like it’s got your back, it only pays you back the Ex-Showroom Price, but the RTI insurance also covers road tax and registration charges you had paid. Be the superhero your car needs and protect it all the way. You know what they say, go the extra mile for your car and it’ll go many extra miles for you! 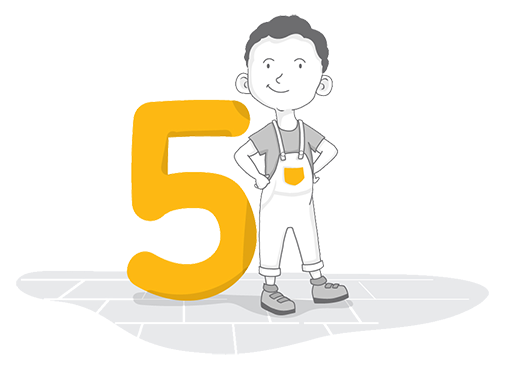 We're making insurance so simple, now even 5-year-olds can understand it. A dad has promised his kid a pizza, and they visit a pizza shop to buy him one. The kid selects one for Rs.300, but then goes on to add extra toppings which increases the price to Rs.450. The child eats two slices and gets the rest packed to take home. As the child rushes out in a hurry to meet his dad, the pizza falls from his hand. He’s very disappointed. His dad agrees to buy another pizza for him,and gives him the full Rs.450 instead of Rs.300, so that the kid can buy the entire pizza with his favourite toppings all over again. The dad just Returned to Invoice (RTI) with the pizza. Digit is a General Insurance company on a mission to Make Insurance Simple for people. We are backed by Fairfax, one of the largest insurance companies in the world.